Love the mats, perfect fit. Seller never responded to any of my messages! The mats are great, they dont move on carpet! Easy to cut along the edges too! The Mats are not what was described in the pictures.I paid $17 for $8 Mats. Not everything they sell are exactly as says, beware. Car mats i bought was bad. I have a 2007 Rav4 and these mats almost perfectly fit where they are needed to go. The description of them would be more accurate if the following was included: "some trimming may be required." The two front mats needed a little trimming to fit nicely around all the contours of the floor. The rear mat was too wide to properly fit. I cut it into three sections (left, right, middle) and placed them in such a way that they do the trick. None of this was difficult and considering the price I was more than fine with making these adjustments. Overall very satisfied and would have given 5 stars if either the product fit without any adjustments needed or if the description reflected that they may need some trimming. 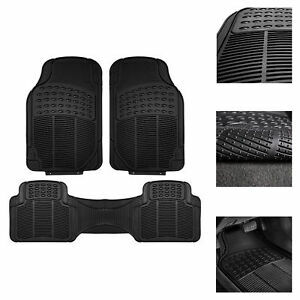 After reading the good reviews and seeing the good price, I purchased these for my new Honda CRV to use this winter. I love rubber mats in the winter so that when the snow melts from my boots, the lip in the mat contains the water. These are not heavy. They barely have a lip on them. They slip all over the place. For the price, they are fine but I’m disappointed. Some of the mats didn't fit even using the cutting lines but they weren't far off. Was able to cut them to size and have them still look good. Definitely keeps the floor cleaner than fabric mats. Especially with New England winter! I purchased for my 2015 rav4. Granted you can cut them to fit properly, its about an 1 inch too long in the backseat and slightly too small for the front seats floor. The front is small length and width but covers the main foot area. I have a 2014 Ford Focus Sedan, I thought they would fit perfectly but they didn't. Once I cut them they were perfect, we didn't have to cut too much either. I'm happy with the product though. Isn't too thick but for the price it's great. Looks nice & came brand new as well. I haven't put in the front mats but they look like they would fit, might have to cut those too. But overall I think it's a pretty decent product.